Society? Economics? Politics? Personality? What causes inequality? Abstract Over the past 40 years, inequality has exploded in the U.S. and significantly increased in virtually all nations. Why? The current debate typically identifies the causes as economic, due to some combination of technological change, globalization, inadequate education, demographics, and most recently, Piketty’s claim that it is the rate of return on capital exceeding the growth rate. But to the extent true, these are proximate causes. They all take place within a political framework in which they could in principle be neutralized. Indeed, this mistake is itself political. It masks the true cause of inequality and presents it as if natural, due to the forces of progress, just as in pre-modern times it was the will of gods. By examining three broad distributional changes in modern times, this article demonstrates the dynamics by which inequality is a political phenomenon through and through. It places special emphasis on the role played by ideology – politics’ most powerful instrument – in making inequality appear as necessary. This paper was circulated by NEP-HIS on 2015-05-05. It explores a topical issue in political discourse at present, in which the debate has largely been categorised into two major camps. First, the Conservative argument, stretching back to Margaret Thatcher in Britain (and simultaneously championed by Ronald Reagan and Charles Murray in the USA) was that inequality was good and accepted by the populace as a way of categorising and organising the nation. Their argument, it so followed, ensured that those who were at the lower part of society would be inspired to work harder as a means to lessen their inequality. The second argument that has now experienced resurgence in the UK following the election of the left wing veteran Jeremy Corbyn to the leadership of the opposition Labour Party is that inequality is an evil in society that punishes the poor for their poverty. The counter argument is that the richer, which have the broadest shoulders, should bear the heaviest burden in times of hardship, and that austerity should not hit the poorest of society in the hardest way. Thus a political solution should be sought to ensure a fairer distribution of wealth in favour of the poorest in society. Similar arguments have been made in the US by proponents of increased state welfare. It is in this context that the debates highlighted in this paper should be seen. 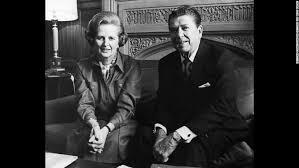 Thatcher and Reagan were the major architects of a change in economic policy away from state welfare. This meticulously researched article demonstrates that inequality as a phenomenon has long roots. Citing that inequality has virtually been omnipresent in the world since the dawn of civilisation, Wisman couches the argument concerning inequality within the wider organisation and economic hierarchy of society. Building on the argument of Simon Kuznets that inequality, at the beginning of economic development shows vast differences between rich and poor but subsequently stabilises, he looks at other factors beyond economics that contribute to the growing inequality in society. The heavy focus on political literature examining the impact of politics on rising inequality is especially interesting, and takes this paper beyond the traditional Marxist arguments that have often been proposed about the failures and flaws of capitalism. 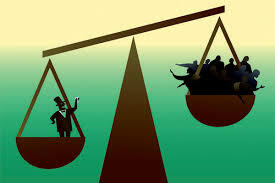 Other arguments, such as the impact of the industrial revolution, are explored in detail and are shown to be significant factors in defining inequality. This runs as a counter-exploration to the work of Nick Crafts who has explored the extent to which the industrial revolution, especially in Britain, was ‘successful’. Despite the arguments and debates about why inequality exists, there still appears to be no conclusive answer about its cause. Ideology is also a factor that is explored in detail. The explanations for inequality have often been provided with ideological labels, with some offering proposals for eradicating inequality, while others propose that individuals, and not society, should change in order to reverse the trend. The latter was forcefully proposed by Margaret Thatcher and Milton Friedman, whereas the former was commonly the battle-cry of post-war socialist-leaning parties (most notably the largely out-of power Labour Party of Britain in the post-war period, with the exception of 1945-51 and brief periods in the 1970s). The religious argument about helping people who are less fortunate than yourself has now become more tenuous in favour of using religion as a form of legitimizing inequality. The exploration of religion as a factor is also particularly interesting here. Wisman argues that providing state institutions with religious foundations thus legitimises their status, and hereby ensures that inequality has a stronger place in society. This point, while contentious, has been alluded to in previous literature, but has not been explored in great depth. The section in this paper on religion is also small, although such is its significance, I am sure the author would seek to expand on this in a later draft. This paper is wide-ranging, and shows a large number of factors that have contributed to inequality in the western world, especially the USA. It highlights the fact that the arguments concerning inequality are more complex than has possibly been previously assumed. Arguing that politics and economics are intertwined, it effectively argues that a synthesis of these two disciplines are required in order to address the issue of inequality and reduce the gap between rich and poor in society. I found this article absolutely fascinating. I can offer very little in terms of suggestions for improvement. However, one aspect did come to mind, and that was the impact of inequality on individual/collective advancement? Perhaps this would take the research off into a tangent too far away from the author’s original focus, but the issue that sprung to mind for me was the impact of the inequality mentioned by the author on aspects such as educational attainment and future employment opportunities? For example, in the UK, the major debate for decades has been the apparent disparity between the numbers of state school and privately-educated students attending the nation’s elite universities, namely Oxbridge. Arguments have often centred on the assumption that private, fee-paying schools are perceived to be better in terms of educational quality, and thus admissions officers disproportionately favour these students when applying to university. While official figures show that Oxbridge is made up of a higher proportion of state school student than their privately-educated counterparts, this ignores the fact that over 90% of British students are still educated in the state system. Furthermore, so the argument goes, those with an elite education then attain the highest-paying jobs and occupy the highest positions in society, thus generating the argument that positions in the judiciary and politics are not representative of the composition of society. These are complex arguments. This paper alludes to many of these points concerning the origins of inequality. Perhaps a future direction of this research would be to apply the models highlighted and apply them to certain examples in society to test their validity? This entry was posted in Economic growth, Economic History, Inequality, USA and tagged economic history, inequality, long-run economic growth, USA on 2015-10-21 by crowleymarkj. ABSTRACT: We show that the consequences of historical warfare for state development differ for Sub-Saharan Africa. We identify the locations of more than 1,500 conflicts in Africa, Asia, and Europe from 1400 to 1799. We find that historical warfare predicts common-interest states defined by high fiscal capacity and low civil conflict across much of the Old World. For Sub-Saharan Africa, historical warfare predicts special-interest states defined by high fiscal capacity and high civil conflict. Our results offer new evidence about where and when war makes states. The consequences of war on the development of nations have been gaining increasing attention in both Economics and Economic History alike. 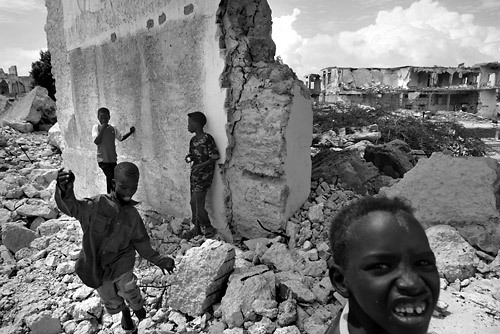 This paper by Dincecco, Frenske and Onorato, distributed on NEP-HIS on 2015-09-05 studies the consequences of wars on state development for Sub-Saharan Africa. The paper refers to a rather large body of research developed within the field of Political Economics. The standard account, mostly focused on the European experience, predicts that the rise of warfare will lead, after the end of a conflict, to greater fiscal capacity and less civil conflict. The mechanism was first studied for Europe in the period 1500-1800 by Tilly (1993). Rulers generally had little political consequences from defeats, at least until the early 1800s, when Napoleon started replacing monarchs who had lost wars. Before then, wars were a quite regular phenomenon. Wars led to the expansion of the sources of taxations which was easily maintained in peace time. This enabled European states to enforce internal security more effectively, lowering civil conflict. The major implication of this perspective is that countries that experienced more wars in the past, today show greater fiscal capacity and less civil conflict (Fearon and Laiting, 2014; Besley and Persson, 2015). As noted existing research focuses on Europe, so it is interesting to see that Dincecco, Frenske and Onorato (DFO) find different results when applying the same premises to Sub-Saharan Africa. The paper by DFO begins by presenting two opposing views. On the one hand, there is evidence that the standard account of more wars in the past lead to greater fiscal capacity and less conflict today also applies to Sub-Sahara Africa. Specifically Michalopoulos and Papaioannou (2013) document evidence suggesting that more conflicts lead to more state centralization. Meanwhile that of Bates (2014) suggests that more centralized states are the most developed in the African continent. On the other hand, the opposing view focuses on a series of characteristics of the Sub-Saharan region (such as slave trade and colonization) that are responsible for the failure by the standard account to explain the trajectory of African states. 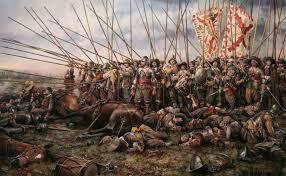 The Battle of Rocroi, by Augusto Ferrer-Dalmau. The paper by DFO takes a comparative approach, testing the relationship between historical warfare and state development in several continents. The empirical strategy is rather intuitive, taking four measure of fiscal capacity of states today and regressing them on the number of conflicts that affected each region. They include a set of standard controls (latitude, population density, arable land and so on) and also continental fixed effects. The same procedure is then repeated for three measure of civil conflict today. The first result is that fiscal capacity today does increase in all continents for countries that experienced more wars in the past. Sub-Sahara Africa makes no exception here. The second result deals with civil conflict and this is different. Here, unlike the other continents, Sub-Sahara Africa shows a positive correlation between historical warfare and civil conflict today. DFO are well aware of the possible shortcomings of their strategy, which are shared with virtually all works trying to address outcomes today caused by institutional arrangements from the past (one above all, Acemoglu et al. 2005). Dincecco and coauthors provide a comprehensive list of robustness checks by adding further observable controls. They also acknowledge that in spite of these controls, unobservable characteristics related to both historical warfare and present state development might still bias their results. They apply a quite interesting methodology to give an idea of the potential bias: they provide a measure, used by authors like Nunn and Wantchekon (2011), that estimates how much greater the impact of unobservable variables should be, relative to the observable, to explain the variation in the data. The result is that unobservable variables would need to have a nearly 20 times stronger impact to explain the variation in the sample. This result of course does not rule out that some of these variables have a role, but it ensure us that a fair amount of the explanatory power lies in the observable variables. Another remarkable feature of the paper by DFO is that it addresses the issue of the time span between the dependent and the explanatory variables. This is in a way a structural issue of all this branch of research, but it is always reassuring to see authors taking it into account. They do so by running the model with intermediate outcomes (around the beginning of the 20th century) and showing that these two showed a similar pattern to today’s. DFO also provide a tentative explanation to why states in Sub-Sahara Africa might behave differently than Europeans. DFO do so by including measures of democratization, ethnic fractionalization and social trust as controls in the regression. They add these one by one, looking at the effect of these controls on the magnitude of the coefficients of interest. The only control here that seems to have an effect on the coefficients is social trust. However, the authors interpret the result with caution because of the small sample size (here only Sub-Sahara Africa is included, lowering the number of observations to only 47). Regarding the use of measure of social trust to explain the relationship between warfare and fiscal capacity/civil conflict today, I would also be worried about two other points: firstly, the measure of social trust is based on a survey from relatively recent times (1980s onward) while the relationship tested is between historical warfare and fiscal capacity/civil conflict today; secondly, this measure could be highly collinear with the variables considered (of course, the usual caveats on reverse causality that are typical in this line of research also apply here). To conclude, the paper by DFO contributes to both the debate within Political Economics by quantitatively testing a well-established narrative on a region of the world that is very different from the standard one used in the past (meaning empirical studies based on Europe). By doing so, it does find that Sub-Sahara Africa experienced a different dynamic that led to a different outcome today. It also shows a very careful work on the data used and it addresses several sources of criticism. A possible next step could be to take further the analysis of the mechanism behind through which war impacts state development. Acemoglu, D., , S. Johnson and J. Robinson (2001). “The Colonial Origins of Comparative Development: An Empirical Investigation.” American Economic Review, 91: 1369-1401. Bates, R. (2014). “The Imperial Peace,” in E. Akyeampong, R. Bates, N. Nunn, and J. Robinson, eds., Africa’s Development in Historical Perspective, pp. 424-46, Cambridge: Cambridge University Press. Besley, T. and T. Persson (2015). “State Capacity, Institutions, and Development.” The Political Economist Newsletter. Fearon, J. and D. Laitin (2014). “Does Contemporary Armed Conflict Have Deep Historical Roots?” Working paper, Stanford University. Michalopoulos, S. and E. Papaioannou (2011). “The Long-Run Effects of the Scramble for Africa.” NBER Working Paper 17620. Nunn, N. and L. Wantchekon (2011). “The Slave Trade and the Origins of Mistrust in Africa.” American Economic Review, 101: 3221-52. This entry was posted in Africa, Economic Geography and tagged Africa, Civil conflict, Fiscal capacity, State development, Warfare on 2015-10-07 by missiaia.